Entering The Greats: Masterpieces from the National Galleries of Scotland, I felt like a thirsty man in the desert who had stumbled across an oasis. It’s been a very, very long time since the Art Gallery of NSW had an exhibition of such indisputable quality. It is not only the names that are well known, but the paintings as well. The best works from the Edinburgh gallery are reproduced in all the monographs and catalogues. They are worthy of a trip to Scotland, let alone to the AGNSW. It’s pure pleasure to stand in front of pictures by Velázquez, Vermeer, Botticelli, Titian, Rembrandt and many lesser-known artists who are represented by outstanding pieces. For instance, the painting most readily associated with the NGS is not by a master of the Italian Renaissance, but by a Scotsman, Henry Raeburn. His Reverend Robert Walker skating on Duddingston Loch (c.1795) is an image for the ages. A clergyman dressed in formal black attire experiences a moment of freedom, one leg extended elegantly in mid-air as he propells himself across the ice. We feel as if we have discovered something precious about the Reverend Walker’s personality, simply by observing this pose. The same holds true for John Singer Sargent’s magnificent portrait of Lady Agnew of Lochnaw (1892), a society belle who will remain forever young and desirable. The sitter looks out at us with a half-smile, one eyebrow slightly raised. Although Lady Agnew was convalescing from an illness, Sargent has translated any signs of exhaustion into an expression of worldly languor. 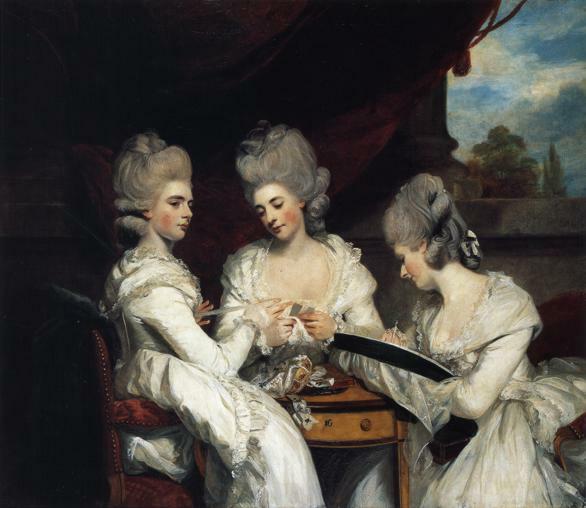 Joshua Reynolds’s triple portrait of The Ladies Waldegrave (1780-81), takes a different approach, showing three sisters with the most elaborate hair-dos and make-up, engaged in their sewing. The sitters are completely preoccuppied, as if Reynolds crept up on them and took a snapshot. They are as immaculate as statues, and just as aloof. thought for beautiful small pictures by artists such as Watteau and Corot; and a stunning selection of drawings and watercolours by Leonardo da Vinci, Poussin, Lotto, Titian, Rubens, Rembrandt, Tiepolo, Ingres, Blake and Turner. The works on paper have been interspersed throughout the display in a typically sensitive exhibition design by Sydney architect, Richard Johnson. The major Scottish artists are given a room to themselves, while the final gallery brings together paintings by modern masters, from Degas, Monet and Pissarro to Gauguin, Cézanne and Seurat. The Greats is an exhibition that lives up to its portentous title. It reminds us of the very best reason to go to art galleries – not to marvel over the building, the views, the gift shop or the café; not to be educated or entertained; but for that rare opportunity to experience a work of art that can transport us to another reality, another time and place.